Over the last few years, pop-up shops have really taken over the business scene. More than just seasonal shops selling costumes or tree ornaments when appropriate, the new-age pop-up shop gives business owners the chance to revitalize their brands more often and give consumers something to get excited about. Pop-up shops have been showing up across the country, particularly during fashion weeks. Designers are using them to create buzz about their products and get customers eager to spend at exclusive shopping events. This business model is a great way for entrepreneurs to keep their overhead costs low, while allowing property owners quick fixes for their space. Not only are new, upstarting brands taking advantage of the pop-up idea, but established brands, too. Fendi just opened a pop-up shop in Soho and the event was more than major. Fashion designers are just some of the business making the most of the pop-up. Chefs are doing it and foodies are happy. As we keep moving through the summer, we're finding culinary pop-up shops at neighborhood festivals and concerts. Businesses can catch a large number of people at once, and with social media, be a hit in an instant. 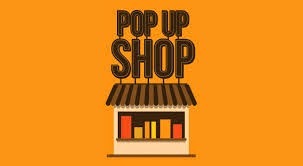 Have you tried any pop-up shops? Considering using it for your business? Consultants can do it, too! What do you think?